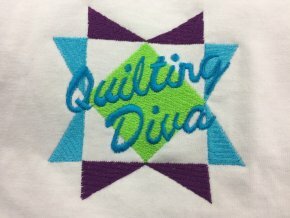 We are so excited about the Quilt Diva Retreat coming in October! I am attaching the link to our website for the registration forms/brochure for you to print. It's under Calendar on the website! If you cannot print it, please contact us or stop in for a copy! Times: Friday, October 6 you can start at 10:00am (or whenever you can get there). We'll stop that night around midnight! On Saturday morning we'll resume around 8:00am until midnight (or later) again! Lodging is NOT included in retreat fees. There are 2 hotels in town, call early for reservations. Friday Supper, Saturday lunch & supper. We also ask everyone to bring a snack to share for the "grazing" table! 2. Lamp- lighting is good but sometimes you need a little more! 5. You can bring a comfy chair if you wish! 7. Cash- for massage, or if you go uptown- some businesses don't take cards. We are planning to demo the newest craze: Moda Cake & Cupcake Recipes! If you don't know what those are, you need to be at the retreat! If you want to see these but can't come both days, we'll do these on Saturday! We will also be playing our "smuggler's dice or other game. We will let you know what to bring to play! *Cancellation policy: You may cancel and receive a FULL refund if you cancel by Sept. 15. Cancellations from Sept. 16-30 will receive 50% refund. After Sept. 30, NO REFUNDS will be given. You may at any time transfer your registration to another person, but please inform us by phone or email if you wish to do so. T-shirts: Sports & Shirts has designed an OPTIONAL t-shirt for the retreat. Cost: $17 S-XL, and $19 XXL. The design is embroidered on a soft cotton shirt. You can choose shirt color (they will choose thread colors for design) and placement. Logo can be placed either left chest or centered on chest. Logo is 3.5" square. Shirt colors: Pink, Orange, Yellow, Lime, Aqua, Navy, Sapphire, Purple, & Black. We hope to see you in October! Our regular newsletter will be coming out soon!